Inspired by his childhood memories of Charlie Russell, Tom Lucas always had a deep desire to create art of the Western culture. His lifestyle as a cowboy, mountain man, hunter, trapper and outdoorsman serves as the ultimate foundation for his art. Tom’s passion for being creative was always waiting to be fulfilled by the next canvas. His life experience lent validity to his artwork, as he paints with emotion while capturing a culture or lifestyle. As a self taught artist of over 40 years, Tom has a natural ability and an intimate understanding of his subject matter, which allows him to paint and express his creative nature, whether it be a western or a wildlife subject. In recent years, he has enjoyed the opportunity of attending several oil workshops, allowing him to further develop his painting skills. Having mastered his technique and style he continues to maintain a library full of research materials and art books by his favorite artists; Charles Russell, Carl Rungius, Bob Kuhn, Ken Carlson, Nicolas Fechin, Harley Brown and David Leffel, which inspires him daily. Tom Lucas’s interest and passion of ancestral tool making has led him to be documented on PBS in such films as Sheep-Eaters: Life in the Mountains and Archers of the Yellowstone. 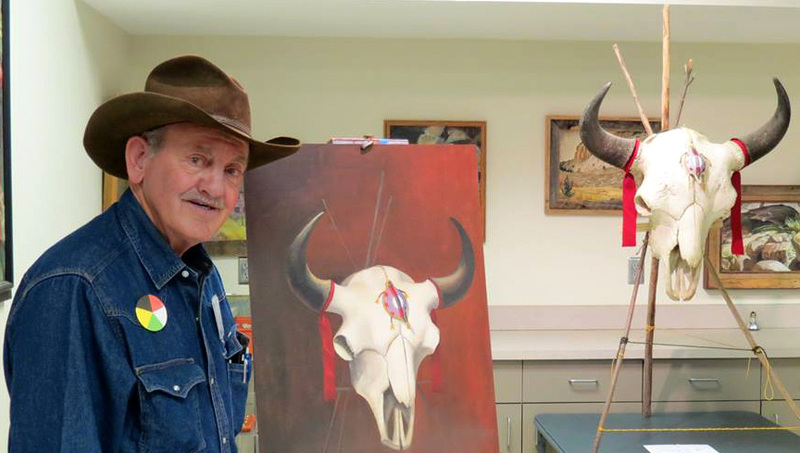 Known as Tomahawk Tom in the Mountain Man arena, Tom has mastered replicating Indian artifacts (Big-horn sheep bows, War-bonnets, beaded clothing and shoes, horn scoops, knives, arrowheads, etc) many of which are subjects in his paintings and are on exhibit in museums in Wyoming. Tom spends most of the year in his Wyoming studio or at the Tom Lucas Western Art gallery in Dubois, Wyoming . 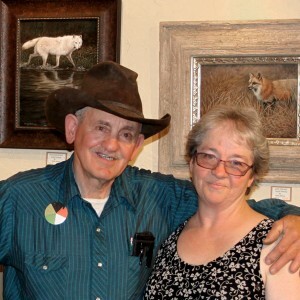 Tom Lucas currently resides in Dubois Wyoming with his wife Tammy who travels with him to art shows across the country.